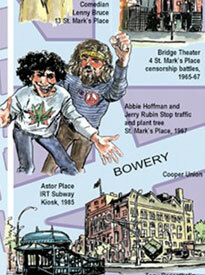 For over a half-century, the East Village has been the locus of bohemian and avant-garde culture in New York City. 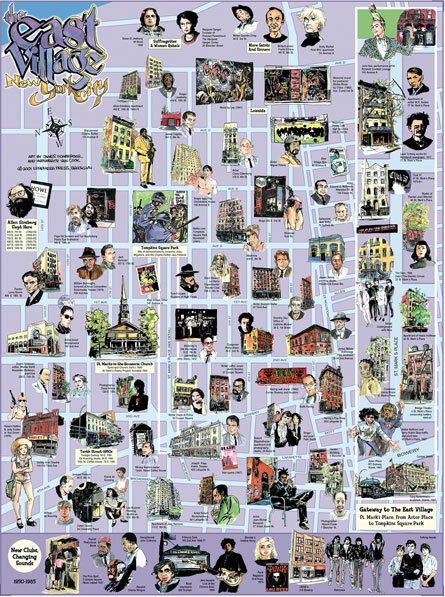 This illustrated map spotlights the writers, artists, musicians, actors, entrepreneurs and political leaders who have helped define new directions in American fine arts and popular culture. 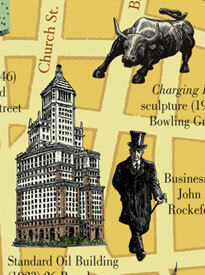 Featuring caricature portraits and accurate renderings of buildings and streets, this pictorial map makes for an entertaining and educational poster. The back of the map provides addresses and an easy-to-use walking tour of the neighborhood. 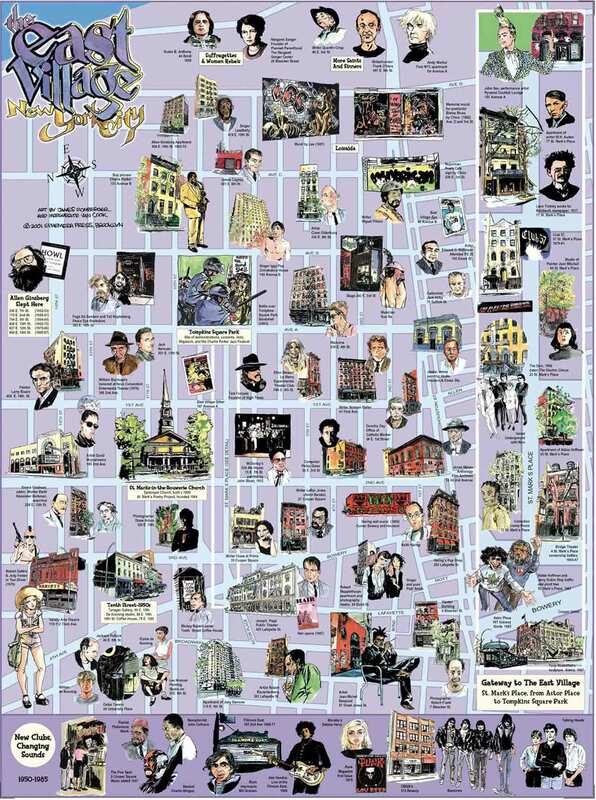 The East Village Map is much more than an attractive wall poster. 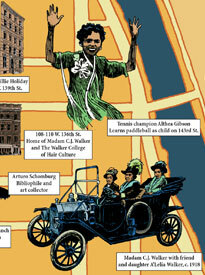 It also contains a well-researched walking-tour guide to the neighborhood's historic sites. The itinerary includes sixty-eight of the East Village's most interesting spots; each briefly described, and clearly located on a secondary map specifically designed for those visiting the area. 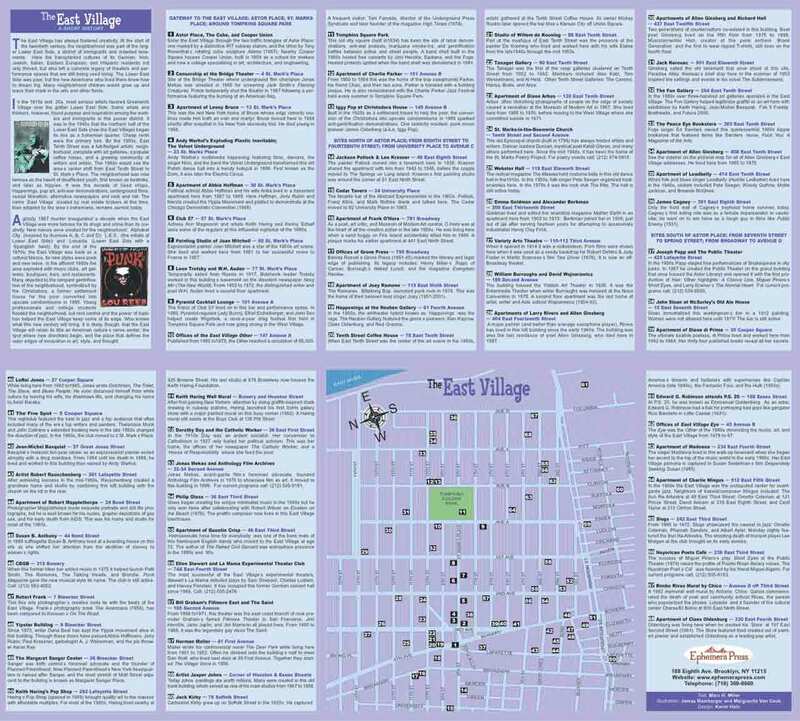 The walking-tour guide is printed on the back of folded East Village maps. Unfolded posters and framed maps come with a separate four-page booklet containing the walking-tour information. The ties between the East Village's and independent and underground film live on at Jonas Mekas's Anthology Film Archive. Learn more about this unique institution's history, collections, and current screenings. 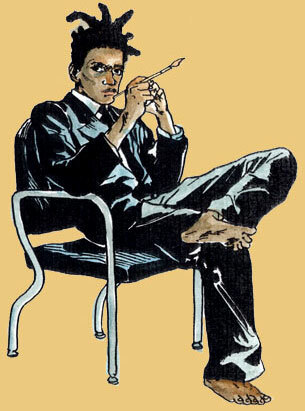 For the last fives years of his life Jean-Michel Basquiat lived and worked on Great Jones Street. "Where Poetry and Art Meet Entertainment, Technology and Commerce." The official website for an important Beat Generation poet who was at the heart of all the East Village action in the 1960s. 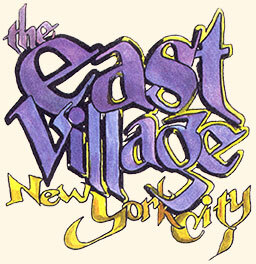 Sponsors East Village walking tours and maintains a blog that spotlights stories about the history of the neighborhood. Everything you need to know about this short-lived East Village landmark. The official site of the Allen Ginsberg Trust. Very nicely done. An online exhibition and much more illuminate the pioneering American radical, feminist, and East Village resident. Learn about the East Village art giant of the 1980s and shop at the Haring Pop Shop. A yearly festival of East Village Arts. 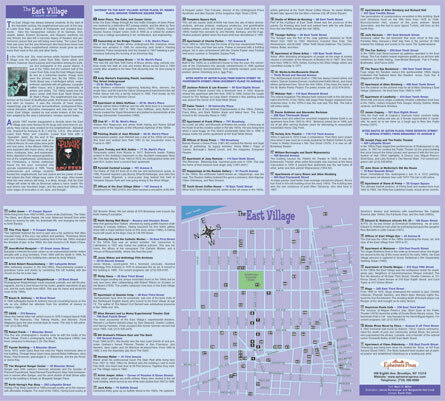 Lists every past performance at this groundbreaking East Village theater as well as the program of its current season. This now defunct bar just off Union Square had many connections to the East Village. A great history website with up-to-date information about many local legends. Extraordinarily detailed interactive map. The East Village sections are particularly good. This still active East Village venue is bigger and more influential then ever. 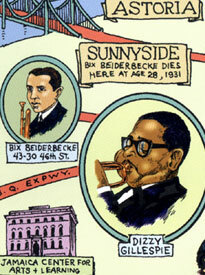 Features pictures of Parker's East Village home and interesting links including one to the Charlie Parker Jazz Festival. Chronicles the history and current activities of this venerable poetry institution. A guide to sites in New York City associated with Patti Smith. History and pictures of this now legendary drag festival that started in Tompkins Square Park.